Lodge: Stunning views, gas fireplaces, and wireless internet access make the lakeside lodge an ideal spot to unwind and stay connected. Log Cabins: Full of scenic charm, but not lacking in amenities, our log cabins are a luxurious and unique way to vacation on the San Juan Islands. Canvas Cabins: An enchanting outdoor lodging experience, our canvas cabins combine the charm of a lodge room with the serenity of a night under the stars. If the word “glamping” didn’t already exist, we’d have to invent it to describe these inviting cabins. 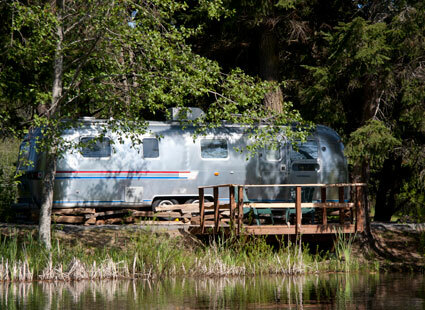 Airstream: The most delightful retro camping space in the San Juan Islands, our classic Airstream trailer is situated at an exclusive dock overlooking Neva Lake. 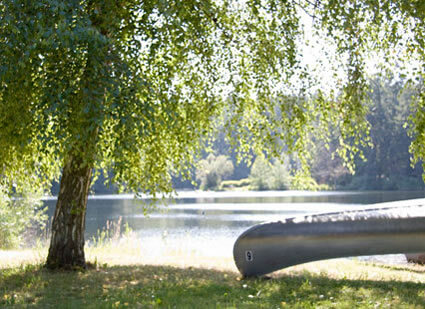 Campsites: Whether you’re looking for an RV campsite or a place to pitch your tent, our lakeside and forested sites are perfect for soaking up the outdoors of Lakedale Resort. Yurts: We’ve re-invented the Yurt! 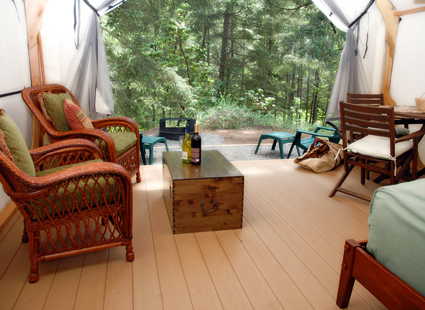 Our seven luxury Yurts take “glamping” to the next level of glamorous! Now featuring three new docks and expanded hiking trails. 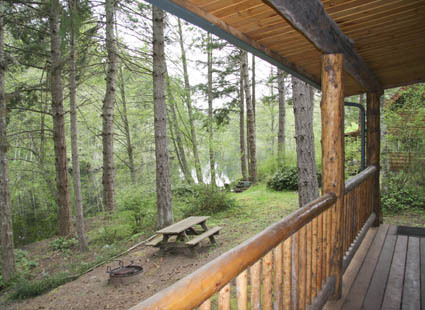 Log Cabins are pet friendly so bring your favorite canine to experience Lakedale. Lakedale's Canvas Cabins were on the cover of Sunset Magazine! Every site has its own fire ring and picnic table. Be too cool for school and stay in our newly renovated retro Airstream.